For rapid motion, program G0 axes, where all the axis words are optional. The G0 is optional if the current motion mode is G0. This will produce coordinated motion to the destination point at the maximum rapid rate (or slower). G0 is typically used as a positioning move. For linear (straight line) motion at programed feed rate (for cutting or not), program G1 'axes', where all the axis words are optional. The G1 is optional if the current motion mode is G1. This will produce coordinated motion to the destination point at the current feed rate (or slower). G28 uses the values stored in parameters 5161-5169 as the X Y Z A B C U V W final point to move to. The parameter values are absolute machine coordinates in the native machine units as specified in the ini file. All axes defined in the ini file will be moved when a G28 is issued. If no positions are stored with G28.1 then all axes will go to the machine origin. 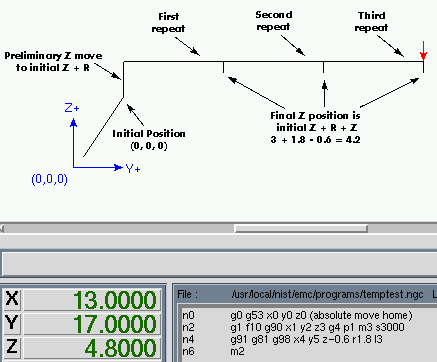 G28 axes - makes a rapid move to the position specified by axes including any offsets, then will make a rapid move to the absolute position of the values in parameters 5161-5166 for all axes specified. Any axis not specified will not move. G30 functions the same as G28 but uses the values stored in parameters 5181-5189 as the X Y Z A B C U V W final point to move to. The parameter values are absolute machine coordinates in the native machine units as specified in the ini file. All axes defined in the ini file will be moved when a G30 is issued. If no positions are stored with G30.1 then all axes will go to the machine origin. G30 - makes a rapid move from the current position to the absolute position of the values in parameters 5181-5189. G30 axes - makes a rapid move to the position specified by axes including any offsets, then will make a rapid move to the absolute position of the values in parameters 5181-5189 for all axes specified. Any axis not specified will not move. For Z only tapping preposition the XY location prior to calling G33.1 and only use a Z word in the G33.1. If the coordinates specified are not the current coordinates when calling G33.1 for tapping the move will not be along the Z axis but will be a coordinated, spindle-synchronized move from the current location to the location specified and back. For rigid tapping (spindle synchronized motion with return), code G33.1 X- Y- Z- K- where K- gives the distance moved for each revolution of the spindle. A move from the current coordinate to the specified coordinate, synchronized with the spindle at the given ratio and starting from the current coordinate with a spindle index pulse. Spindle-synchronized motions wait for spindle index, so multiple passes line up.G33.1 moves end at the original coordinate. You will not be able to use a probe move until your machine has been set up to provide a probe input signal. The probe input signal must be connected to motion.probe-input in a .hal file. G38.n uses motion.probe-input to determine when the probe has made (or lost) contact. TRUE for probe contact closed (touching), FALSE for probe contact open. Program G38.n axes to perform a straight probe operation. The axis words are optional, except that at least one of them must be used. The axis words together define the destination point that the probe will move towards, starting from the current location. If the probe is not tripped before the destination is reached G38.2 and G38.4 will signal an error. After successful probing, parameters #5061 to #5069 will be set to the X, Y, Z, A, B, C, U, V, W coordinates of the location of the controlled point at the time the probe changed state (in the current work coordinate system). After unsuccessful probing, they are set to the coordinates of the programmed point. Parameter 5070 is set to 1 if the probe succeeded and 0 if the probe failed. If the probing operation failed, G38.2 and G38.4 will signal an error by posting an message on screen if the selected GUI supports that. And by halting program execution. G41/G42 D0 is a little special. Its behavior is different on random tool changer machines and nonrandom tool changer machines (see the Tool Change section). On nonrandom tool changer machines, G41/G42 D0 applies the TLO of the tool currently in the spindle, or a TLO of 0 if no tool is in the spindle. On random tool changer machines, G41/G42 D0 applies the TLO of the tool T0 defined in the tool table file (or causes an error if T0 is not defined in the tool table). 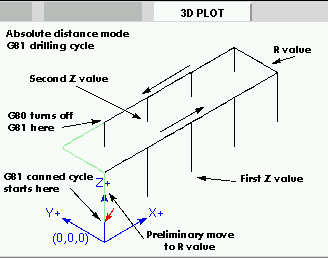 To move in the machine coordinate system, program G53 on the same line as a linear move. G53 is not modal and must be programmed on each line. G0 or G1 does not have to be programmed on the same line if one is currently active. For example G53 G0 X0 Y0 Z0 will move the axes to the home position even if the currently selected coordinate system has offsets in effect. G61 - Exact path mode, movement exactly as programed. Moves will slow or stop as needed to reach every programed point. 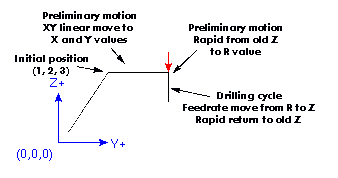 If two sequential moves are exactly co-linear movement will not stop. G61.1 - Exact stop mode, movement will stop at the end of each programed segment. The pins motion.spindle-at-speed and the encoder.n.phase-Z for the spindle must be connected in your HAL file before G76 will work. See the spindle pins in the Motion section for more information. All canned cycles are performed with respect to the currently-selected plane. Any of the nine planes may be selected. Throughout this section, most of the descriptions assume the XY-plane has been selected. The behavior is analogous if another plane is selected, and the correct words must be used. For instance, in the G17.1 plane, the action of the canned cycle is along W, and the locations or increments are given with U and V. In this case substitute U,V,W for X,Y,Z in the instructions below. Only use G92 after your machine has been positioned to the desired point. G92 makes the current point have the coordinates you want (without motion), where the axis words contain the axis numbers you want. All axis words are optional, except that at least one must be used. 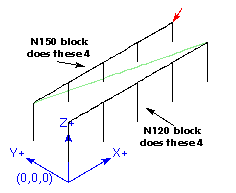 If an axis word is not used for a given axis, the offset for that axis will be zero. When G92 is executed, the origins of all coordinate systems move. 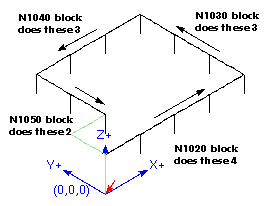 They move such that the value of the current controlled point, in the currently active coordinate system, becomes the specified value. All of the coordinate system’s origins (G53-G59.3) are offset this same distance. 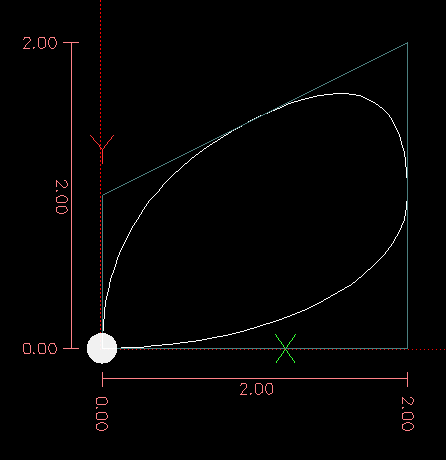 G92 uses the values stored in parameters 5211-5219 as the X Y Z A B C U V W offset values for each axis. The parameter values are absolute machine coordinates in the native machine units as specified in the ini file. All axes defined in the ini file will be offset when G92 is active. If an axis was not entered following the G92, that axis' offset will be zero. Being in incremental distance mode (G91 instead of G90) has no effect on the action of G92. G92.1 - turn off G92 offsets and reset parameters 5211 - 5219 to zero. G92.2 - turn off G92 offsets but keep parameters 5211 - 5219 available.